Since Facebook first rolled out instant articles back in May, there had been speculations about if the social media giant would make it available for small scale publishers and if at all it did, why would they embrace it? Now that it has opened up the gates of instant articles to everyone, Facebook has made sure no one can refuse its offer with huge incentives. Facebook Instant Articles: Joining, Setting Up, and Monetizing Them https://t.co/dYMXvSu5g8 via @DigitalGYD | Excellent! In this bloggers’ guide to Facebook Instant Articles, I will walk you through the detailed process of how you can join it, design or format your Instant article and also earn ad revenue from it. But, before I tell you how you can enroll for Instant articles and how you can monetize your content on Facebook, let me just give a brief about what Instant articles are. Facebook instant articles are a new way for publishers (both small and large) to distribute stories on Facebook. An Instant article is a HTML5 document that is optimized for fast loading, custom branding, and a customized visual display. Facebook instant articles will load 10 times faster than traditional articles on mobile browsers. What sets Instant articles different for Facebook is, they are interactive and users won’t have to leave the platform in order to read an article. After they click a link shared on Facebook, the post will open directly on Facebook instead of taking you to a browser tab. If you follow some of the largest publishers, Mashable, New York Times, National geographic etc, they have Instant articles enabled. If you click a URL of them on facebook mobile, you will not be redirected to a browser to read it, instead, you read it inside the good ol’ Facebook mobile app. 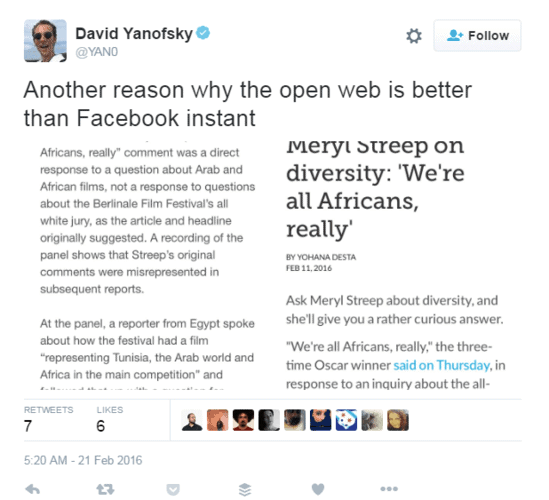 When Will Facebook Instant articles open up for everyone including small publishers? Facebook’s Instant articles program will roll out starting this April 12th, via the Facebook’s F8 conference. Are Facebook Instant Articles a competitor to Google’s Accelerated Mobile Pages? Google’s AMP is also a similar concept that lets you speed up your website pages at a lightning speed. But they currently don’t seem to be competitors because publishers can use both; AMP to speed up their website browsing experience and Instant Articles to drive referral traffic from Facebook. Why should you join Facebook Instant articles? Advantages? Facebook allows you to insert ads in your content and keep 100% of the ad revenue from direct-sold ads. You can also use facebook’s own Audience Network to monetize your content and keep 70% of the revenue generated from it. We’ll discuss about the rules for ad placement in facebook instant articles later in the post. Publishers with instant articles are given full freedom to design and brand their own content on Facebook. This means they get a quality audience (from Facebook) for their blog and also not compromise with the ad revenue. While we don’t know what the future holds for instant articles in terms of visibility, Facebook is known for giving royal treatment to early adopters of new features. We can cite the success of Facebook videos here. Until announced otherwise, I am sure facebook instant articles will enjoy all the benefits of Facebook’s EdgeRank. These are going to be great ways to drive traffic to your blog. Adapting instant articles will get your site in front of more audience. The mechanism behind this is, traditionally, when a reader saw an article they either clicked or waited for it to load or skipped it due to time issues. Now that you have faster, seamless experience with interactive features, you will be able to entice these abandoning visitors. 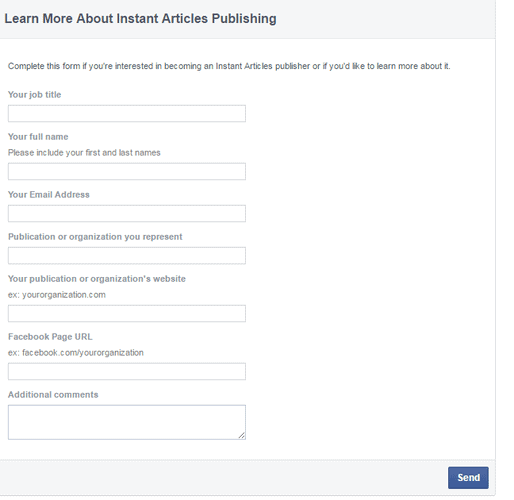 How to join Facebook Instant Articles? If you want to get started with facebook instant articles you have to sign up for their program using the sign up form on this page. Fill in your details on the above page and Facebook will inform you about proceedings through the email you gave. What are the requirement to get started or sign up for facebook instant articles? A Facebook page If you don’t already have, create one here. Admin control of the page. Since facebook instant articles runs on mobile devices, you must have Facebook for Iphone version 30 (and IOS 7.0 or above) and Facebook for android version 57 (Jellybean or above). How to design or format an Instant article? Since facebook instant articles are the same HTML5 version that any standard blog or web publishing uses, you can pretty much use the same codes for creating the instant article post. CSS styling is not provided as of now. For detailed guides on setting up canonical URL, logo and other features on designing facebook instant articles, you can refer to this section. How to insert ads to earn from facebook instant articles? You are enabled to monetize your own instant articles with direct display ads and keep 100% of the revenue. You can also have integration with facebook Audience Network (FAN) to monetize your articles and keep 70% of the revenue generated. You will have to contact with your facebook team to let you enroll on their FAN. For ad placement rules on facebook instant articles, you have to have at least 350 articles in between two ads and if you have images and multimedia on your articles, the ads should not exceed 15% of the estate. You have to just give the URL of your banner ads and Facebook will directly render them from the specified URL. All ads will have a heading depicting them as “sponsored content”. The ads will be responsive in design. Important: Join This Affiliate Program to earn up to $7500 per affiliate sales. Disadvantages of Facebook Instant articles? Are they better than the open web articles? There are not so many instances where, as of now, you can point the demerits of Facebook Instant articles, but I guess as and when it rolls out to the publishers, glitches might surface. Just yesterday, I was reading an article on Re/Code, where it pointed out the following issues. Mashable, which is amongst the early guinea pigs to test Facebook Instant Articles, had an article on Meryl Streep gone wrong. Even when Mashable corrected the error in their open web blog, the error seemed to be the same in the Instant article version of the post. That means, as of now, when you update a post on the web version; Facebook Instant Articles cannot refresh the content and display the same. Facebook’s Instant articles are nice, highly engaging and have advantages of their own but, they can never replace open web articles. The freedom one gets when reading an article in the web version can never be available on Facebook. After all, a walled garden is the iteration of a cage. Does Facebook instant articles have analytics support? How to track engagement and content views? Yes, you can always track audience demographic, overall traffic and everything else just like you did before. To measure traffic and engagement on facebook instant articles, you can use your default web analytics program or Facebook’s own in-house analytics program. You can also view your visits, link clicks and similar stats from your Instant Articles dashboard of your Facebook page. Facebook instant articles mean duplicate content for search engines? Almost all the bloggers and marketers have one question. Does Facebook’s Instant articles mean duplicate content? The answer is NO. Facebook gives you, in fact, it requires you to enter the canonical URL of your blog. If you fail it will automatically fetch the blog’s RSS feed. So you don’t have to worry about duplicate content. How is Facebook instant articles program different from medium or LinkedIn Pulse? In Instant articles, you don’t write a new post. It is the same version of your post that is on your blog. Think of instant articles as your RSS feed reader. Whereas, in Pulse or Medium, you write posts on your own. That is user generated content. In case, the latter decide to end or modify their platform, your content or blog posts are at risk. But on Instant articles, you don’t have to fear to own your content, because it is just a version (say a browser) that fetches your original article. In case of LinkedIn Pulse, or Medium, you have chances of duplicate content penalty because they do not facilitate you to add canonical URLs to your post. But facebook avoids duplicate content issue in Instant articles from the scratch. You can view full documentation about facebook instant articles along with formatting and troubleshooting, here. 10 2-minute tweaks to brand yourself on Facebook? How to get a lot of Facebook likes, organically! Facebook’s Instant Articles will be a great way to engage your audience with interactive content. This also means more business to Facebook and boost its earnings significantly, since it can keep readers within its own walled gardens. Previously, whenever a user clicked an article on Facebook it was redirected to the smartphone’s default browser and the article loaded there. This meant so much lag and slow process that sometimes users can close the Facebook app and not return to it until the next session. Also, if the user found an article interesting, he would further enter the rabbit hole of the web thus forgetting Facebook. With Instant article, you are forced to stay within the walls of Facebook, thereby, subject to it’s ads, and the same Facebook’s revenue generating schemes. The complete guide to getting started & succeed with Facebook Instant Articles! Thanks, Facebook Instant article so Fast. I hearing a lot about the Facebook instant article but I didn’t find the right information to know much about, this article really helped me a lot to understand the dynamics of Facebook instant articles. I think Facebook is moving very fast these days to attract users and publishers, we have to see how instant article concepts will work for them. Thanks for sharing the inforamtion. Do I need to create a dummy app for my audience network? If so, could you explain how to do this so Facebook knows that the app is for my instant articles audience? My original question was referencing that page, but that page doesn’t clearly explain whether I need to create a dummy app for my audience network. It is also unclear how Facebook would know that the dummy app is for my instant articles. Are you also unclear on this? Hi Jen, sorry for not understanding at first. Since I myself have not created an instant article yet, I have no clue to this. I am however researching the topic and asking some influencers and will get back to you as and when I find the answer. In that time, if you happen to find it before me, do post the solution here. What a wonderful review of Facebook Articles you have given us. I have heard of them, but didn’t get into the subject until now. You have shown exactly how it works and all the benefits for doing it. I am on Facebook a lot and do boost posts at times. I even do Facebook ads here and there. I’ve seen articles around, but didn’t give it a second thought until now. Now I can fully understand the benefits of doing so. Very detailed analysis of the Facebook instant articles. Thank you. I’m currently agreeing with the walled garden / cage aspect. How can I invite someone to optin to my list? I can’t by the looks of it. All I’ll be able to do is send them back to my website in the form of an advert in my own content and have it marked sponsored. I’ve registered for them, but I don’t see how I’m actually going to get traffic from Facebook by using instant articles, all I’m doing is keeping people on FB to my site’s detriment. Yes, when we want things other than the “reading experience” for our Instant article readers, things can be tricky and pain. Custom inputs like making a purchase, subscribing to an email list and hiring you for a service might not have the same fluid experience as they have on our own blogs. I never heard about Facebook instant pages. It is the first time I am reading about it here. Facebook is a great platform with millions and billions of regular users and It is really good to hear about instant pages. As you said that they also allow us to place ads on that instant pages, that’s amazing because we can also earn some money from it but my question is, do Facebook allows Adsense ads on these instant pages? I wonder how you did not know of instant articles till now? But it happens since it is now available for select pages and only on mobile devices so. Yes, you can use AdSense, and other ads like affiliate banners if you like. facebook will also come with an AdSense alternative if you want to use that. I wonder how you did not know og instant articles till now? But it happens since it is now available for select pages and only on mobile devices so. Thanks for sharing such a great peach of information. Before few days, I read about the Instant articles but was unable to understand so clearly. But, you have explained it in a very good manner. I just have a questions that how can we monetize the article? Through Fb ad or Google Ads. And one more question, what will be the article? Is it our blog post or direct post on the facebook.? You are amazing in writing the in-depth details. Honestly speaking, I didn’t read your post, I just overlooked the Subheadings and bookmarked the post to read later. Thanks for sharing all the details of Facebook Instant articles, I’ll give a try for sure! to know about Facebook Instant Articles. at all the details you share. Yes, I read about Facebook’s Instant Articles when it started a few days back – something like LinkedIn had started long back. I guess it certainly makes it easier this way to reach a vast audience and not just your blog readers. Also, the ads section sound interesting, which I still need to look into. I have yet to go through the full details about it, as given on Facebook, though you have covered it all so well here already. The only point that comes to mind is what if Facebook closes this section or makes changes that takes away all your posts – all your hard work goes in a jiffy, whereas your articles on your blog, are your own and will always remain with you. Perhaps you can stick to small posts and not go overboard. Also, is it 350 articles or 350 words articles between two ads, as you mentioned?